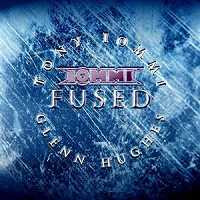 Five years after his self-titled debut CD showcasing various vocalists, Tony Iommi unleashes Fused, his collaboration with bassist and vocalist Glenn Hughes (Deep Purple and Black Sabbath). Stripped away is the Black Sabbath shadow, which made 1986's Seventh Star so difficult for 'Sabbath fans to swallow, thus enabling both Iommi and Hughes to craft some quality music that hearkens to similar efforts but is not weighed down by the Black Sabbath sound. Thus, there's the opener, Dopamine, a straightforward rocker that features some uncharacteristic Iommi guitar licks and some soaring vocals courtesy of Hughes. The Black Sabbath riff rears its mighty head on Wasted Again and some chunky blues-laden guitar hooks and wailing vocals propel Saviour Of The Real. There's even time to slow things down and craft a melancholy ballad of sorts with the powerful Resolution Song, which features a pounding guitar riff and some heavy bass licks. And if it's blues-driven rock you crave, it doesn't get any better than I Go Insane. In a word: Wow! As for the lyrics, they shy away from the supernatural and instead focus on the emotional. Thus, The Spell details the difficulties associated with walking a path only to discover it's the wrong one, I Go Insane chronicles obsession and passion, and Grace is a moving piece that touches upon personal hell and the desire to live a simple and straightforward life. The words are personal but are written so that they appeal to all of us. With Fused, Tony Iommi literally lets spreads his wings. He's free to express himself, and express himself he does. Gleefully along for the ride is Glenn Hughes, whose powerful and varied vocals will knock new listeners for a loop. I can't wait for these two gentlemen to collaborate again. In the meantime, check out The 1996 DEP Sessions, another alliance between Iommi and Hughes that only recently was released.